For a while now the CryptoNight algorithm used by crypto coins such as Electroneum (ETN), Monero (XMR), Sumokoin (SUMO), Karbowanec (KRB) and maybe some others have been quite profitable to be mined by AMD GPUs. That is normal since AMD GPUs are doing better than Nvidia when talking about the CryptoNight algorithm, especially the latest AMD Radeon RX Vega GPUs that are doing really great in that algorithm. Even though AMD’s latest GPUs are still not entirely problem free in terms of software support and can give you some headaches making them work for mining, when they do they work really well for CryptoNight performance wise. We have prepared a quick and easy to follow guide to help you get started and save you some trouble mining CryptoNight with Vega GPUs. – Start by downloading and installing the Radeon Software Crimson ReLive Edition Beta for Blockchain Compute as this is the driver that probably still offers the best performance for mining CryptoNight on VEGA. – When you install the driver you need to go through the Radeon Settings / Gaming / Global Settings and for each and every GPU in your mining rig to make sure that HBCC Memory Segment is disabled as well as if you have Crossfire enabled for a pair of GPUs to also disable it. Reboot the system and check that all of the video cards have HBCC and Crossfire disabled before continuing further. – Each time the system starts you need to disable and re-enable all of the GPUs in your system in order to get the best mining performance, you can do it manually via the Device Manager, though there is also an automated way to do it, so that the mining can start automatically on each boot. For that you need to download the respective version of Devcon for the Windows you are using, here is an easy way to obtain the required devcon version. – The next step is to overclock/underclock the GPUs so that you can get the optimal performance and power usage combination, here things may vary in terms of the settings you can use from card to card. You can use AMD’s Radeon Wattman built-in tool, but it is not very convenient, so going for OverdriveNTool might make things much easier in the process of testing GPU and Memory clock settings. OverdriveNTool.exe -p0"XMR" -p1"XMR" -p2"XMR" -p3"XMR" -p4"XMR" -p5"XMR"
– Now you can go for the CryptoNight miner software, there are number of these, but not all of them give you the best performance on Radeon RX Vega GPUs. The two choices for best performance at the moment are Cast XMR and the latest version of XMR-stak. 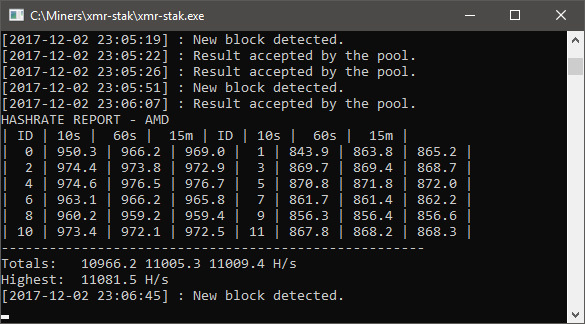 If using XMR-stak just make sure you configure the miner with two threads per GPU, this would require more virtual memory. Both miners need quite a lot of virtual memory, so make sure you have something like 48-64 GB to be on the safe side and problem free. Following the tips above you should be able to get 1800-2000 H/s for mining CryptoNight on a single AMD Radeon RX Vega GPU, depending on your GPU and memory settings, so the performance is quite good if you are able to keep the video cards cool enough. If using the XMR-stak miner you can also mine some coins using the CryptoNight-light such as AEON, the settings are the same, this algorithm just produces about double the normal CryptoNight hashrate.